LONG WEEKEND: Ecological Horror Meets Arthouse Style – Schlockmania! Australia’s late ’70s/early ’80s boom of genre filmmaking is fascinating because so many of the films take unique chances. Free of the established rules of a Hollywood-style film business, the Australian filmmakers had a lot of leeway to take chances with offbeat subject matter and unconventional approaches to genre filmmaking. A great example of these qualities in action is Long Weekend. Though nominally a horror film with an ecological theme, it is also an unflinchingly dark drama about the foibles of human nature. The premise of Long Weekend has a minimalist simplicity to it: troubled couple Peter (John Hargreaves) and Marcia (Briony Behets) take advantage of the titular holiday to go on a camping vacation at the beach. It’s his idea and she’s not happy about roughing it. Unspoken tensions reveal themselves as the two try to get along: Marcia is dealing with a personal trauma that is causing a lot of friction between the two. However, they are facing a danger to their lives that both are too self-absorbed to notice at first. They both have a habit of treating their natural surroundings with aggression or carelessness. The various animals of the beach ecosystem have noticed and they don’t like it. Soon, the couple finds nature rebelling against in various ways that escalate to frightening levels. The setup sounds ideal for a rollercoaster-style horror flick but Long Weekend takes the road less traveled. Everett DeRoche’s script takes a very deliberate, gradual approach to the horror aspects, instead focusing on the relationship of the couple. He daringly avoids making one more likeable than the other: instead, they both show a penchant for self-absorption and casual cruelty that comes back to haunt them. Indeed, the tart dialogue exchanges between the two are often as brutal as the film’s handful of shocks. The revenge of nature element is slowly folded in, creating simmering tension in the audience because they notice the danger so much earlier than the characters. The slow-paced approach works because the filmmakers invest in craft and atmosphere. Director Colin Eggleston creates a mood that is tangibly eerie from the start, using a creepy score by Michael Carlos and slow yet restless mobile camerawork from Vincent Monton to create a mood that bad things are around the corner. He also periodically perks up the drama with the occasional traditional horror moment, the best being a brief but totally unnerving attack by an eagle. Long Weekend‘s approach relies upon its actors and thankfully the two leads deliver fearless, totally committed performances. Behets carries a lot of the film’s most intense emotions on her shoulders and she delivers without fail, whether she is weeping from internalized grief or lashing out viciously at her significant other. Hargreaves holds his own with her in their intense verbal duels and also shows a lot of grace under pressure in the film’s third act, where he undertakes some difficult physical challenges to fulfill the nerve-jangling finale. In short, Long Weekend is a unique fusion of arthouse and horror concerns where the relationship drama is as grimly compelling as the horror elements. 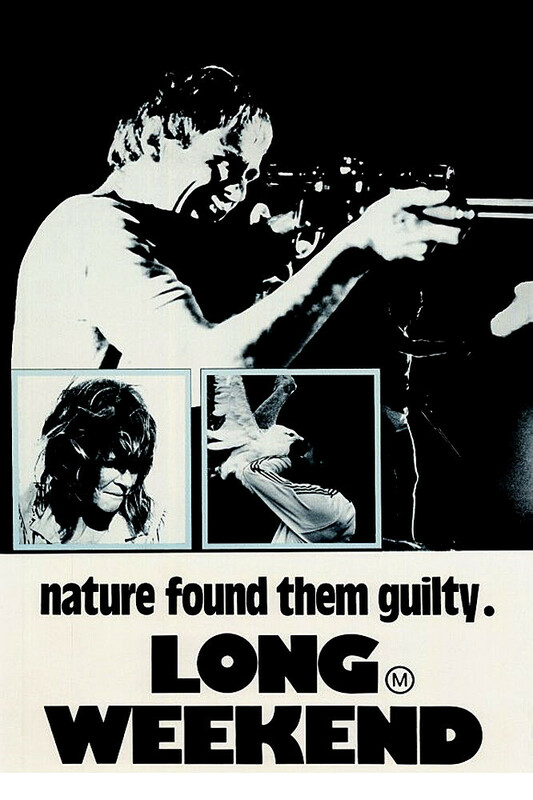 It’s kind of like Day Of The Animals as reimagined by Peter Weir – and if your tastes are wide enough to appreciate such a combination, Long Weekend is a demanding but worthwhile trip to take.